The livestock sector produces more than 5 million tonnes of meat each year, meeting domestic demand, but the target is to increase export, according to Minister of Agriculture and Rural Development Nguyen Xuan Cuong. The livestock sector looks to increase egg exports. At a recent conference on promoting the production and export of poultry products, Minister Cuong said the ministry plans to focus on poultry, considering the big room for development when poultry products account for only 2 percent of total meat output. Poultry consumption in Vietnam is also lower than the world average, which means demand will continue to rise. 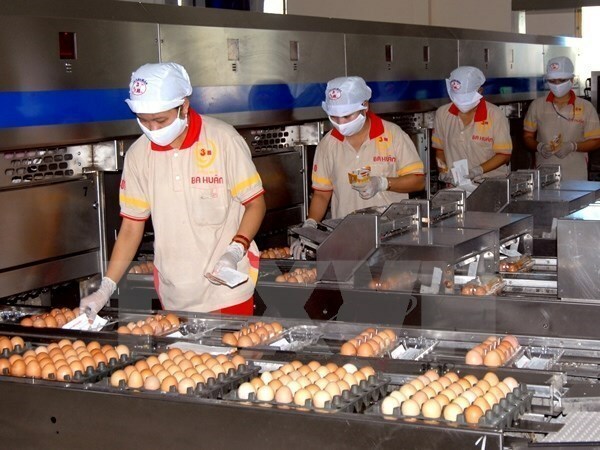 Acting director of the farm produce processing and market development Nguyen Quoc Toan cited statistics that show average consumption of eggs in Vietnam is at 110-120 per person a year, compared to 250-340 in neighbouring countries such as Thailand and Indonesia. According to Nguyen Van Trong, deputy director of the Department of Livestock Husbandry, the poultry industry has been shifting from small to big scale, with rising productivity and product quality. The total poultry flock is increasing by an average 6 percent a year, with annual output reaching more than 1 million tonnes of meat and more than 11 billion eggs at present. Vietnam has exported between 10-15 million salted duck eggs each year, and began to ship abroad processed chicken in September 2017, with nearly 8,000 tonnes exports in 2018. The country also exports several poultry products such as canned quail eggs, braised black chicken, and egg powder. Among problems facing the poultry sector, experts particularly pointed to the poor quality of breeding stock, and a lack of linkage between farming and slaughtering and processing in the production chain. The agriculture minister urged local authorities to exercise strict control of the production process in livestock farming, and invest more in processing. Regarding export, the sector was advised to focus on processed products to avoid quarantine and food hygienic barriers in target countries.